Review: Life has been good to Linnette Ridgeway. She is young, beautiful, rich and has great business sense. Used to getting her own way and taking whatever she wants in life, she has no qualms stealing her best friend's fiance and marrying him herself. Unfortunately, Jackie (Linnette's former friend), cannot forgive Linnette and Simon for their betrayal. She stalks them in public, follows them on their honeymoon, and is determined to ruin their good time. 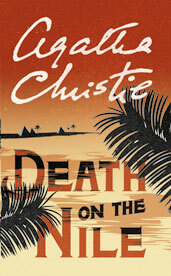 When Linnette is shot in the head, fellow boat passenger Hercule Poirot investigates the murder. Who killed Linnette? A close investigation into several passengers reveal motive, including her jilted friend, an American who swindled some money, a fellow female passenger extremely jealous of Linnette's beauty and money. But who had the opportunity? I'm not sure if I previously watched the movie (starring Mia Farrow) when I was young, but I was able to figure this out. It was still a great read with a lot of details and red herrings along the way to confuse the reader.